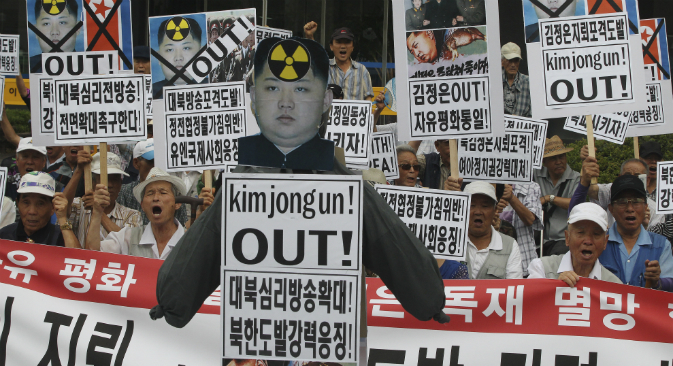 South Korean protesters with defaced portraits of North Korean leader Kim Jong Un and North Korean flags shout slogans during an anti-North Korean rally in Seoul, South Korea, Friday, Aug. 21, 2015. Russian envoy in Seoul calls for overhaul of security environment. Russia’s envoy in Seoul called North Korea’s weapon status “unacceptable,” TASS reports. “Russia’s principled position is that North Korea’s nuclear status is unacceptable for it,” the news agency quoted Russian Ambassador to South Korea Alexander Timonin as saying at the Northeast Asia Peace and Cooperation Initiative (NAPCI) forum in Seoul. Timonin called for an overhaul of the security environment in Northeast Asia. “Much has been done in the past ten years but still it was not enough, so no considerable progress can be seen now,” the ambassador said, according to the report. Timonin said NAPCI could not make major progress unless it involved North Korea. “North Korea is a major part of Northeast Asia, so, it is vitally important to involve Pyongyang into this cooperation. Moscow is trying to do that and plans to continue its participation in the six-party talks,” the Russian diplomat was quoted as saying by TASS. Timonin said “soft” and “tough” solutions to regional problems should be realized concurrently, according to the report.